Like her former boss, US President Barack Obama, former secretary of state and Democratic frontrunner Hillary Clinton not only refused to accept the relevance of the term. Clinton refused to acknowledge what radical Islam stands for. Her opponents agreed with her. The attacks they carry out in the Western world are viewed both as battles for the soul of Muslims worldwide and as a means to terrorize non-Muslims into accepting subjugation. True there are competing schools inside of the world of radical Islam.On the one hand, there is the Sunni version of radical Islam propounded by the Muslim Brotherhood. They want the Islamic empire to be an Islamic caliphate. On the other hand, you have the Shiite version of radical Islam propounded by the Iranian regime in Tehran. Its adherents want the Islamic empire to be ruled by an ayatollah in Tehran. For Americans and the rest of the free world though, this is a distinction without any real meaning. The radical Islamic goal of destroying America – and the rest of the world – is the same regardless of who ends up winning the intramural jihad contest. And as we have seen repeatedly in recent years, the sides are happy to come together to achieve their common goal of killing us and destroying our societies. The Americans’ avoidance of reality is not unique. The Europeans also refuse to see it. Following the jihadist massacres at Charlie Hebdo and Hyper Cacher in Paris in January, French President Francois Hollande insisted that the attackers who killed in the name of Islam had nothing to do with Islam. After jihadists in London beheaded British soldier Lee Rigby outside his barracks in 2013, British Prime Minister David Cameron insisted that the attack, carried out in the name of Islam, had nothing to do with Islam. The operational consequences of the West’s refusal to acknowledge the nature of the forces waging war against it have disastrous. Radical Islam is an ideology that serves both as an organizing principle for civil societies and a military doctrine. By ignoring it, the US and the rest of the free nations of the world have made it impossible to conceptualize or implement a strategy for either discrediting it or defeating its adherents. Rather than develop comprehensive plans for dealing with this enemy, the Americans, the Europeans and others have opted for a mix of policies running the spectrum from appeasement to whack-a-mole operations. Abroad, appeasement has taken its most significant form in the US-led nuclear deal with Iran. As the largest state sponsor of terrorism and the most active radical Islamic imperialist force in the Middle East, Iran is the ground zero of radical Islam. It not only oversees and directs the operations of its puppets, like Syrian President Bashar Assad, and its foreign legions, like Hezbollah. The Iranian regime has also played a key role in developing Muslim Brotherhood offshoots like al Qaeda, which received, and likely continues to receive training and direction from Iran’s Revolutionary Guards. As for Islamic State in Iraq and Syria, if Iran had been interested in preventing its rise, IS would never have taken over any territory in either country. At home, appeasement of radical Islamic forces has involved embracing Muslim Brotherhood front groups and insisting that radical Islamic clerics are moderates because they aren’t pulling any triggers. The West’s whack a mole war against radical Islam at home and abroad has meant that even as one group – like core al Qaeda – is cut down, it is swiftly replaced by other groups, like Islamic State. And if IS is eventually cut down, it too will be replaced by another group, and then reconstitute itself as IS when the West’s attention is taken up by the next major group. Obama has enabled this state affairs by defining the enemy as narrowly as possible, reducing the whole sphere of radical Islam to a few secrete groups – like al Qaeda and IS – that he seeks to defeat or contain. It is not simply that the whack a mole strategy doesn’t work. It is self-defeating. Since the radical Islamic trigger pullers in the West are usually no more than a few people who get together to murder people, insisting that someone has to be a card carrying member of a recognized terror group before authorities will go after him makes it almost impossible to find operatives and prevent attacks. The murderers Friday may well never have received formal orders to commit their attacks from a central jihadist headquarters. They may have met at a mosque in Paris or Brussels and decided to do it. Certainly they needed no advanced training to mow down people eating dinner or watching a rock concert. They didn’t even really need to know how to shoot straight. As for their explosives vests, all they needed was a guy with a working knowledge of explosives to set them up with the means to turn themselves into human bombs. Maybe he trained in Syria. Maybe he has a degree in chemistry from the Sorbonne. Maybe he is just good at following YouTube videos. The most important component of Friday night’s massacre was the terrorists’ radical Islamic motivation. Their belief in their ideology motivated them to die killing innocent people. Everything else was secondary. They may have been inspired and loosely directed by the heads of IS. But if Abu Bakr al-Baghdadi was killed six months ago, they would have found another source of inspiration. And that’s the main point. While Friday’s killers may have given their allegiance to IS, they were operationally and ideologically all but indistinguishable from their predecessors in the London subways in 2005 and the Madrid commuter rails in 2004 who hailed from al Qaeda. Likewise, while the US may have seriously degraded core al Qaeda in the Middle East over the past seven years, IS in Iraq, Syria, Egypt and Libya is an organic extension of al Qaeda. To defeat these groups, the US and its allies need to adopt a strategy that is rooted in an acknowledgment of the nature of our true enemy: radical Islam. Armed with this recognition, the nations of the free world can determine operational guidelines for combatting not only specific, secrete groupings of adherents to this ideology, they can develop overall strategies for combatting it at home and in the Middle East. At home, such strategies require Western governments to penetrate, disrupt and destroy radical Islamic networks on the ground in a sustained, concentrated manner. In the Middle East, they require the free world to stop seeking to appease leaders, regimes and militias that support and ascribe to radical Islam. Sunday night, a group of Parisians stood outside one of the sites of Friday night’s massacre and sang La Marseilles. Without fear, a woman garbed in the black robes of radical Islam stepped into the crowd and began bellowing out Allahu Akbar. She probably isn’t a card carrying member of IS. Rather, in all likelihood she is just someone who ascribes to radical Islam and so sees France as her enemy. Assuming the women doesn’t belong to a terror group, French officials will not monitor her or her relatives. If she or any of her relatives murder their fellow citizens of France, authorities will probably say they were lone wolves. Every day the US and its allies maintain their refusal to acknowledge that radical Islam exists and that the regime in Tehran, al Qaeda, IS, Hamas and all the rest are mere expressions of this larger ideology, the danger radical Islam poses to the survival of free societies will continue to mount and grow. 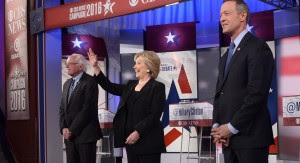 Saturday night’s Democratic debate was a depressing reminder how low we have fallen.